While Fiat-Chrysler Automobiles (FCA) is far from being a sales leader in the current automotive climate, one thing they did right was to concentrate largely on trucks and SUVs. As such, they have the Jeep brand which is entirely dedicated to churning out money-making SUVs of all sizes. No cars allowed under the Jeep banner. They also made the Dodge Ram a standalone brand. Possibly the biggest and most lucrative segment in North America is the one the Ram 1500 competes in. There aren’t too many direct competitors (you can count them all on one hand), yet the next generation brand is crucial to the success of FCA altogether. So when FCA finally gave a much-need overhaul to their half-tonne pick up, most North America took notice. And one of the first things they noticed was the updated styling. Gone are significant styling cues such as the large cross-hair grille. Instead, the Ram takes on a completely new look. Or should that be, completely new looks. You see, the way the mug of your new 1500 looks largely depends on which trim level you opt for. 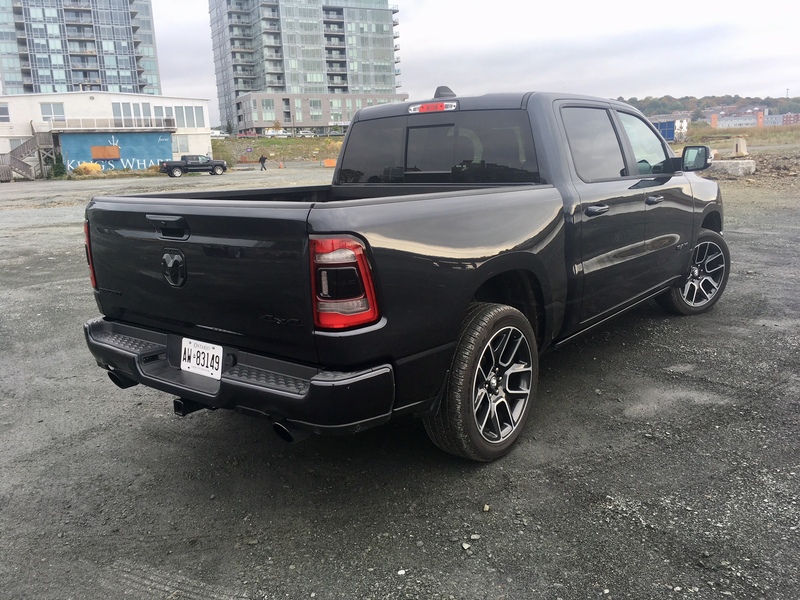 If you opt for the Sport, which is the trim FCA Canada sent my way for review, you’ll get body coloured trim all around, which substitutes a lot of chrome, There’s also dark coloured badging, reflector-style LED headlights and dual exhausts. My tester came with an optional sport performance hood (which includes more bulges and air intakes), and rather nice-looking 22-inch sport wheels. 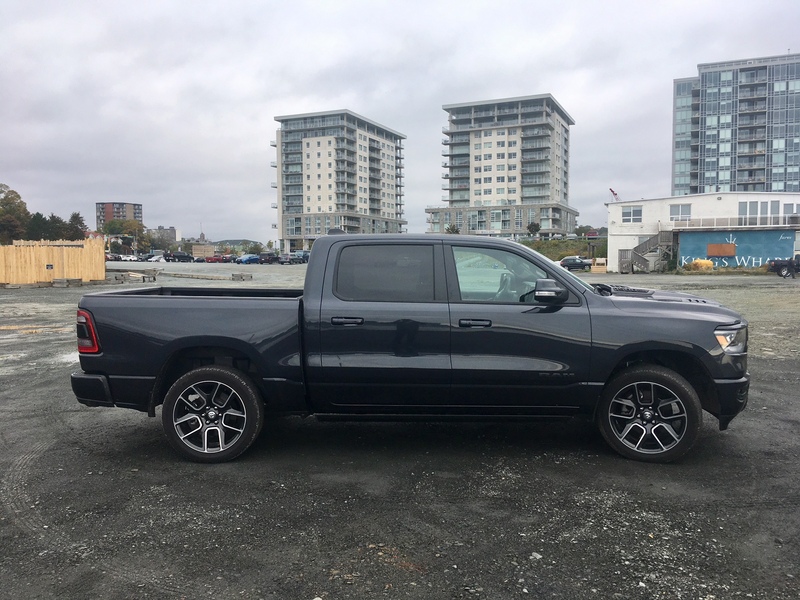 It should be noted that FCA Canada decided to throw us Canucks a bit of a bone by offering the Sport trim exclusively to the Canadian market. If you are American and are jealous, fear not, a Ram 1500 Sport look-alike is technically possible for you, if you spec it out properly. Still, it’s nice to know our tiny little market still gets attention every now and then. Overall though, the new exterior styling is a big departure from the previous generation. Initially I thought I preferred the styling of the previous generation, but after seeing the new design in person, especially in Sport trim, I can safely say the new design will likely become a hit among truck purists. As a bit of an aside, I am pleased to see Ram has decided to fit all Ram 1500s with amber turn signals. Amber turn signals are clearer to see and reduce collisions by 5%. 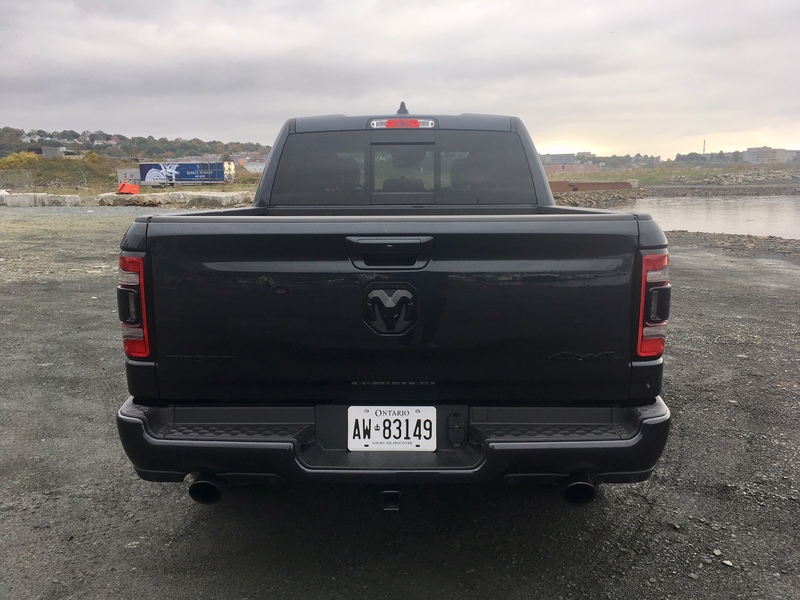 And while I am not a fan of companies who use the brake light to double as the turn signal – something which Ram has done even with the new 1500 – I am pleased to see that at least that signal is LED and still flashes amber. Kudos, FCA. Inside there is lots to talk about concerning the newly redesigned interior, not least of which is the newly available 12-inch infotainment screen that is only available in the upper trims. This long vertical screen mimics the latest offerings from Tesla and Volvo, though the actual set up is thankfully still done by Chrysler, meaning you’ll still get the excellent U-connect system which continues to be, in my opinion, among the best in the business. However, if you opt for the mid Sport trim, this huge screen is not available. Still, the standard screen is still big enough and has a crisp and clear display. But the interior itself can be spec’d out to be quite opulent in upper trims. One might even say it can even rival interiors of luxury car makers. 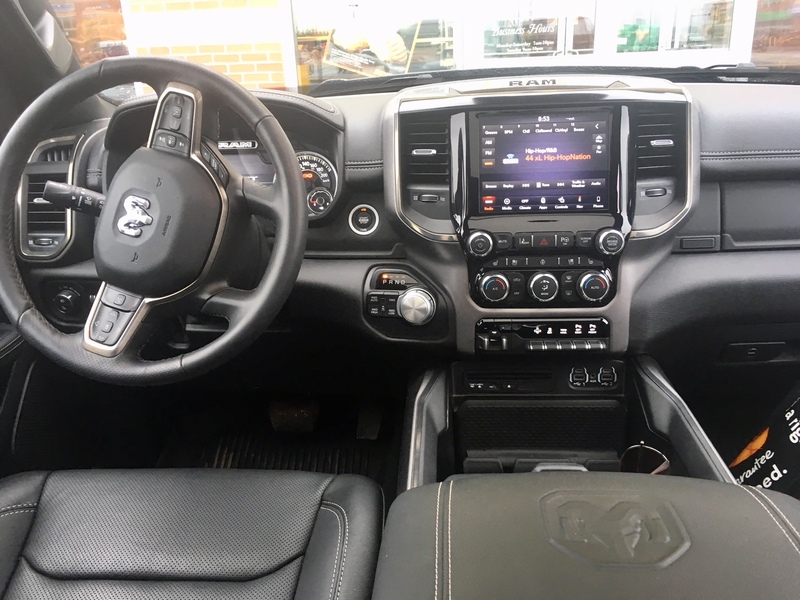 In any event, the interior of the Limited trim is most certainly the nicest truck interior in the business. 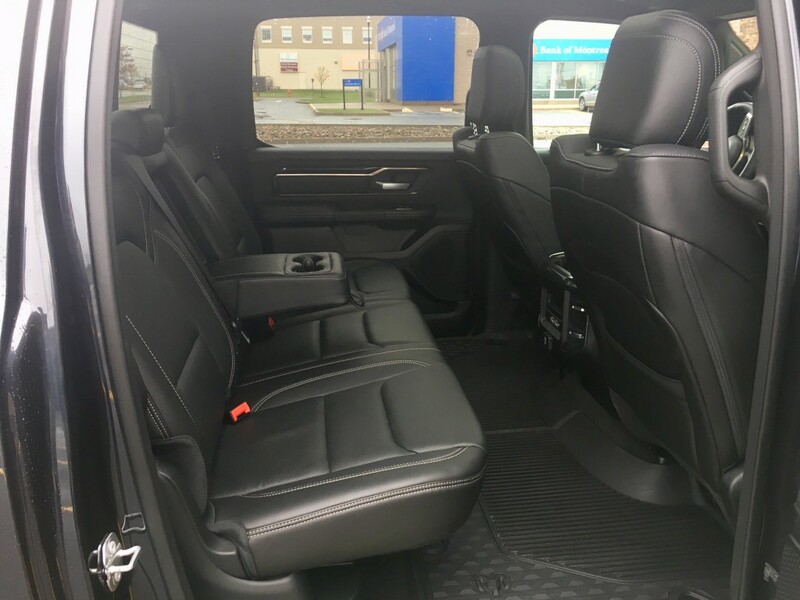 The Sport trim adds exclusive black trim, which is nice to my eyes, but I can understand why some may feel that it makes the cabin feel a bit dark and dreary. There are lots of large dials and knobs – not least of which is to operate the transmission, which takes a bit of getting used to. I would often grab the climate knob when wanting to use the shifter. I imagine this something to be something you eventually get used to, especially since I eventually did near the end of my time with the Ram. As you’d imagine, interior space is not lacking with limo-like leg room in the rear. Those bottom seat cushions can fold upward increasing versatility and my tester came with a really cool storage feature. Underneath the floor mats is a sizeable and lockable cubby hole. There’s one on each side and they are quite deep. Unless you know this feature is there, it will likely go unnoticed by thieves looking for your expensive laptop. I love it! While the Ram boxes are still available, this provides a great solution that allows you to have lockable storage compartments that don’t eat into rear bed space. 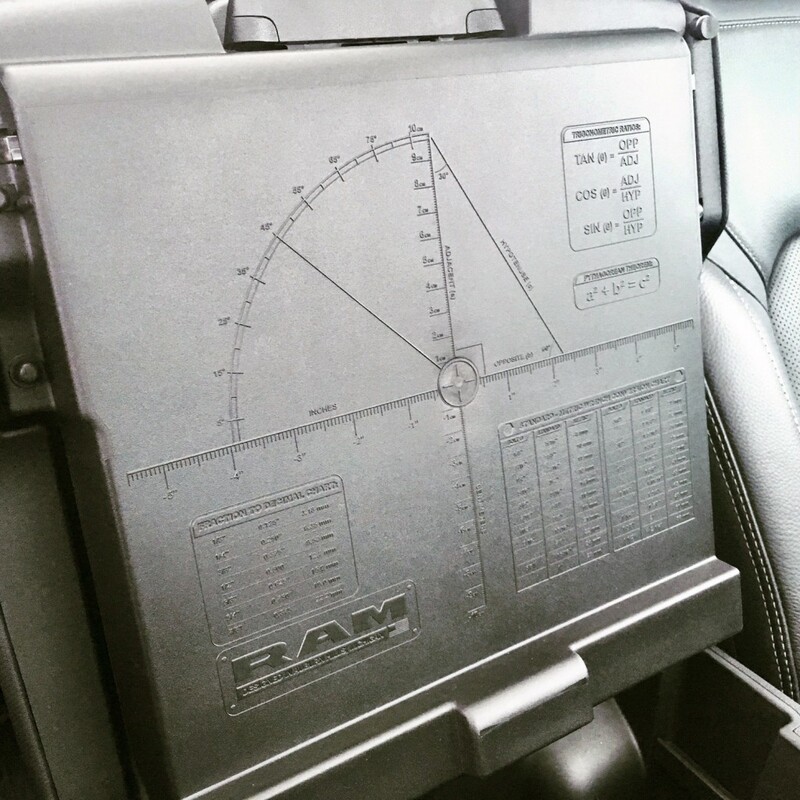 Also, if you are an architect and you are somehow also the owner of a new Ram 1500 and you forgot your protractor and conversion chart, fear not! 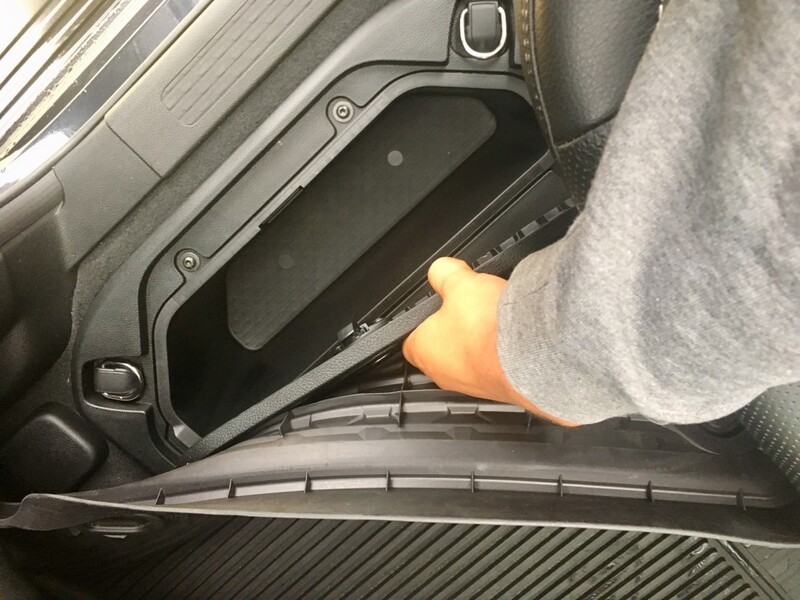 Both are featured under the lid of the centre storage compartment. This is a random feature, but I suppose it’s better to have one than not. Under the hood is FCA’s tried and true 5.7 litre HEMI V8 which is good for 395 horsepower and 410 pound-foot torque mated to an eight-speed automatic. On other trims you can find a V6, a V8 with e-torque (don’t call it a mild hybrid, FCA doesn’t like that but, yeah. It’s a mild hybrid…), and the 3.0 litre diesel option. With the 5.7, the new eight-speed automatic works quite well with smooth and shifts that occur at appropriate times. The 1500 is still a heavy beast so 0-100 times don’t feel particularly quick, but it actually is decent with a recorded 6.1 second time. Oddly enough, sound from the engine and exhaust aren’t sent with the same dramatic flare of HEMIs in the past. You can certainly hear it, it just isn’t delivered with the same gusto. This could be due to Ram’s obvious want to move more upscale. On the road the Ram 1500 feels and drives like it is smaller than what it actually is, which is a good thing for urbanites who feel as if they need a half-tonne pickup in the city for some reason. It feels relatively sure footed in turns and parking lots and is generally easy to maneuver about. My tester came with a back-up camera, sensors and a 360 around view camera making parking a cinch in almost any situation. You wouldn’t want to curb rash those 22-inch rims after all. For that small minority of people who actually intend to use the Ram for its capabilities as a truck (if that’s you, you’re in the minority, unfortunately) you’ll be happy to know that the new Ram has gone on a bit of a diet. Thanks to shedded weight, fuel consumption improves as does towing capacity which now sits at 12,750 pound with the 5.7. FCA was able to shed 102 kilograms from the 1500’s mass thanks to a frame that’s now made of 54% steel. There’s also an aluminum hood and tailgate now. Payload has increased 22% to 2,300 pounds and the brakes are improved with larger rotors. There is also a coil-spring set up in the rear, but the real story is the four-corner air suspension. 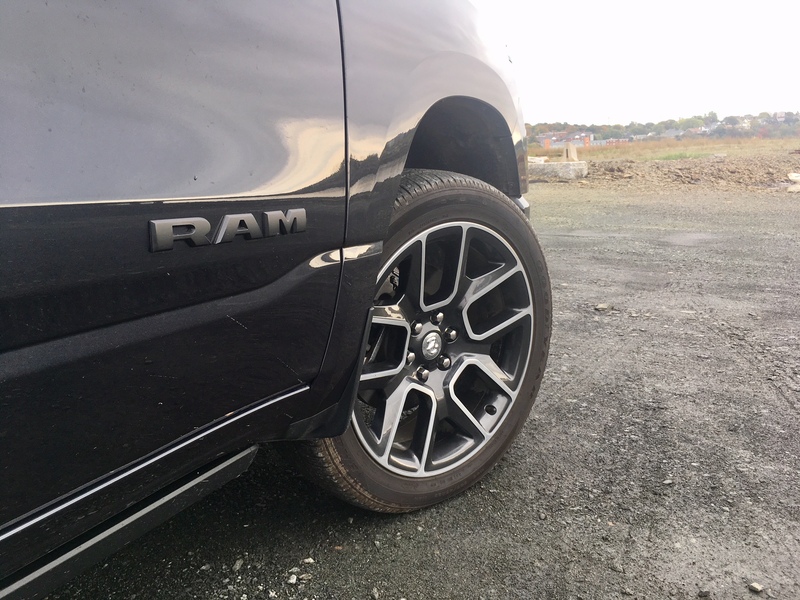 It adjusts the ride height of the Ram either manually or automatically. For instance, the latter will occur during highway driving. It will lower its nose automatically, depending on speed, to achieve the best aerodynamic height which increases fuel efficiency. You can manually lower or rise the ride height yourself for easier entry or for more intense off-roading. I loved this feature in previous Ram 1500s and continue to enjoy it today. While on the highway, you would think you were driving a large luxury barge befitting of celebrities or politicians, not a pick-up truck. It is smooth, comfortable and settled. It glides seamlessly on the road and has good pick-up and passing power when needed. This is one of the best riding trucks in the market today – a feat achieved thanks to that air suspension. It’s a $1,900 option, but if you’re using your truck for lots of travel, it is well worth the money. We certainly appreciated to during our four hour trip from Halifax to PEI. In fact, thanks to that suspension, my fiancee who suffers from hip displaysia was able to sit comfortably through the entire four hours. Normally we would need to stop to give her hip a break every hour. RAM says fuel consumption has improved. Aside form the lighter weight, it also features cylinder deactivation which will allow the V8 to run on four cylinders if the added power isn’t needed. It does this automatically and the switch from eight to four and back again is barely noticeable, even when you’re specifically checking for it. For the 5.7 Sport edition official fuel consumption figured come in at 16.1 city 13.0 highway. After a week fo mixed driving, including that trip to and from PEI, my official numbers came in a 13.0 L/100 kms. Not bad for a V8 attached to a half-tonne. With that being said, filling the tank from empty still cost $120. Granted gas prices were high at the time, but that’s still a lot of money. You’d likely do better with the diesel option if fuel consumption is a concern. But overall I very much enjoyed my time with the new Ram 1500. I’ve driven all of its competition before and I can safely say that this new one is one hell of a credible contender. It ticks off all the right boxes and has class exclusive firsts to go along with it. The new look is either love it or hate it, but I dare anyone to hate the Sport trim specifically. It is immensely comfortable, premium feeling and has the best infotainment system in the business. There are a multitude of trims from more serious off-roader to luxurious liner and everything in between. The bottom line is, if you’re just looking to Ford or GM for your half-tonne needs, you’re doing yourself a huge disservice. The new Ram is one hell of a good truck.